Soon, the questions and speculation started pouring in. What could it be? Was it a black market motherboard? A prank gone wrong? Was Dan trying his hand at art college? After some research, I found a good explanation. Just like any major manufacturer out there, Cisco gives each project a code name while under internal development. It makes it easier to refer to instead of typing a project number out each time, plus if any information about it leaks out before it’s ready, the competition is scratching their heads wondering why you might be working on a new Shire-friendly device. the switch uses a combination of hardware and software to create a ring between all members of the stack in order to emulate the backplane of a chassis switch. 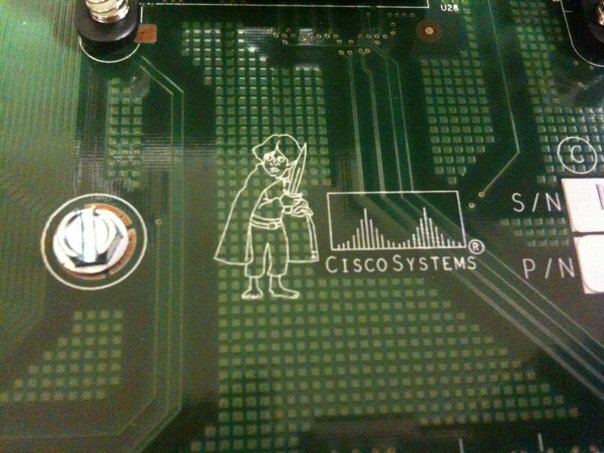 During internal testing, this new technology get tagged with the code name Lord of the Rings, which is why you’ll find our little Hobbit friend of the motherboard of your 3750 if you open it up. Cisco CRS-1 -> HFR (Huge Fast Router, or Huge F***ing Router depending on who you ask). Named after the Cisco GSR 12000 from above. And yet it needed to be changed to a less specific and more PC acronym. HFR lives on if you look at the software loads for the CRS-1, though. They all start with “hfr”. So the next time you find yourself staring at a fictional character on a motherboard, don’t automatically assume that it’s something sinister. It might just be an homage that only gets seen by 10 or 15 people. Who then post it on the Internet and ruin the surprise for everyone. By the way, if anyone out there knows any other cool Cisco product code names (for released products), post a comment and let me know. These kinds of things are the stuff I expect to win on Jeopardy! with at some point in my lifetime. This entry was posted in Routing, Switching by networkingnerd. Bookmark the permalink. You know, if Frodo had pushed a pallet of 3750s over the precipice and into Mt. Doom, I would have cheered all the more. Hmmm, why do you say that? 3750s have a notoriously high failure rate. The Stackwise config is a bit testy, and Stackwise v1 is almost worse than just cabling them together via uplink ports. Check out http://aconaway.com for the musing of an engineer that has fought them one time too many. A “show hardware” on several products reveal some interesting things.